I've been active in the tattoo community for almost 20 years. Eddie teaches me new things about the art every time I talk to him. Sailor Eddie with his motorcycle in front of his shop, Bonnie & Clyde's Tattoo Parlour. 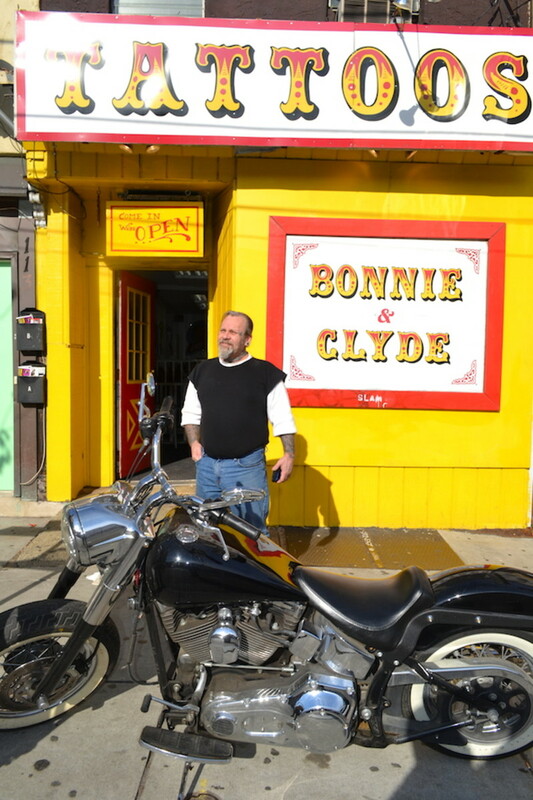 Bonnie & Clyde's is a traditional tattoo shop: comfortable, clean, and inviting. I first met Sailor Eddie at the Annual North Carolina Tattoo Convention held in Greensboro, NC. Eddie was one of the farthest-traveling tattoo artists to attend the convention. We were lucky to have him, and I hope he will come back for future events. At first meeting, you might think of Sailor Eddie as gruff, or even cocky. He speaks the truth, and he speaks his mind. Truthfully, Ed is a generous, friendly, and funny person. At 50 years of age, he already has more knowledge and history accumulated about his art than some tattoo artists learn in their entire lives. If that makes Eddie opinionated, then he has a right to be. 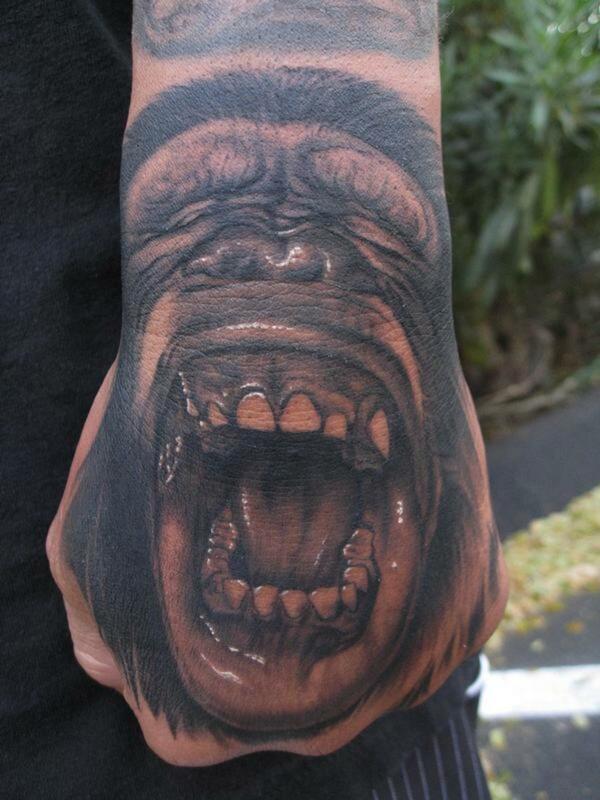 There aren't many working tattoo artists who have his years of experience. Recently, I traveled to Philadelphia to do some video work, and while I was in town I called up Sailor Ed to see if I could get a few minutes of his time and see his shop. 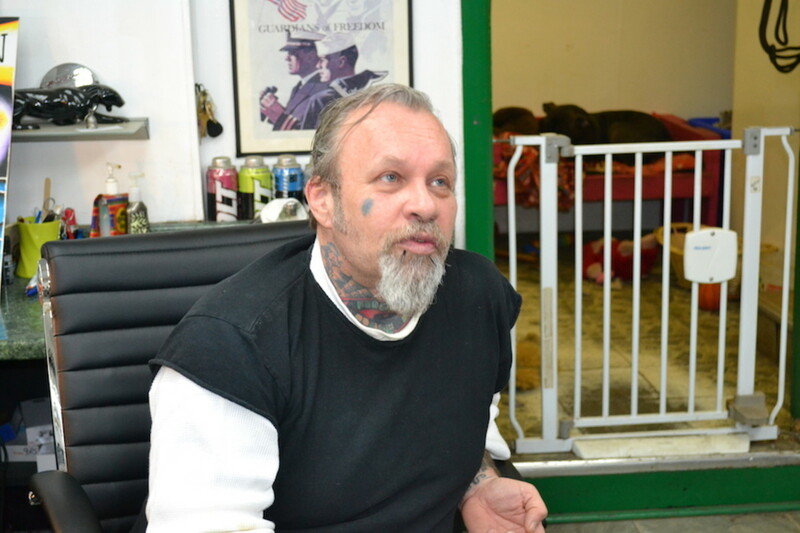 During our brief visit, he shared a number of historic photos and stories about his evolution in the tattoo industry. Sailor Eddie's stories, knowledge, history, and artwork could fill a series of videos and articles. My schedule allowed only a brief visit to his shop. There's no telling what else we could learn from Sailor Eddie with more time to look and listen. 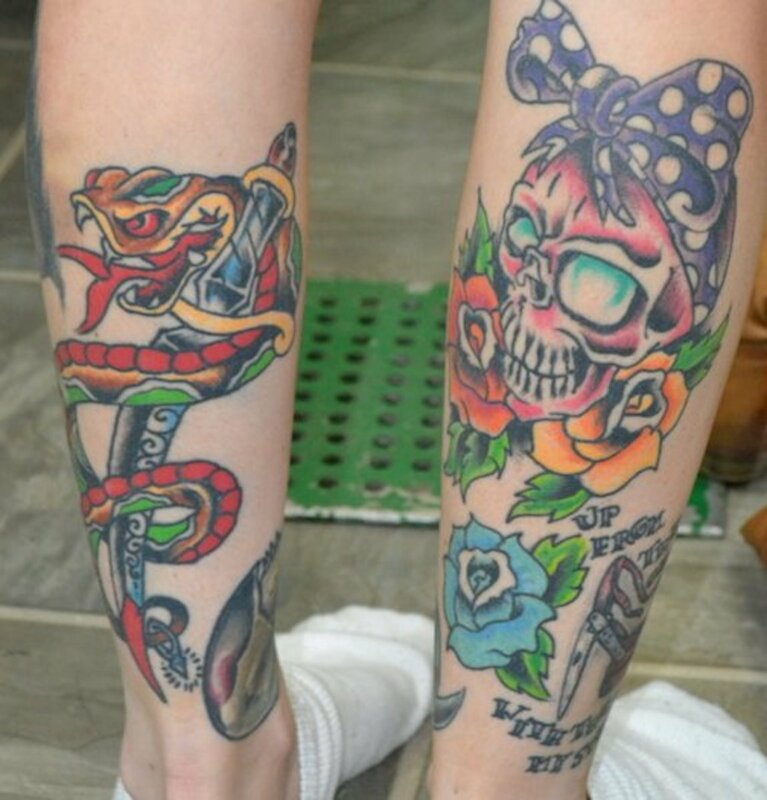 Custom tattoos done by Sailor Ed on his apprentice, Suzie. 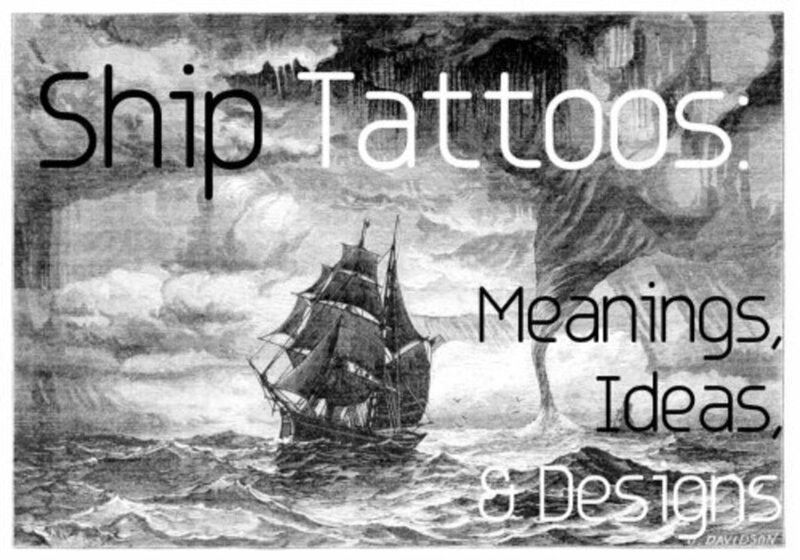 Traditional Tattoo Art Isn't "Simple"
Sailor Eddie explained that the essence of classic tattoo design hinges on three things. It should be colorful with bold lines, it should be able to be seen from across the room, and it should last forever. 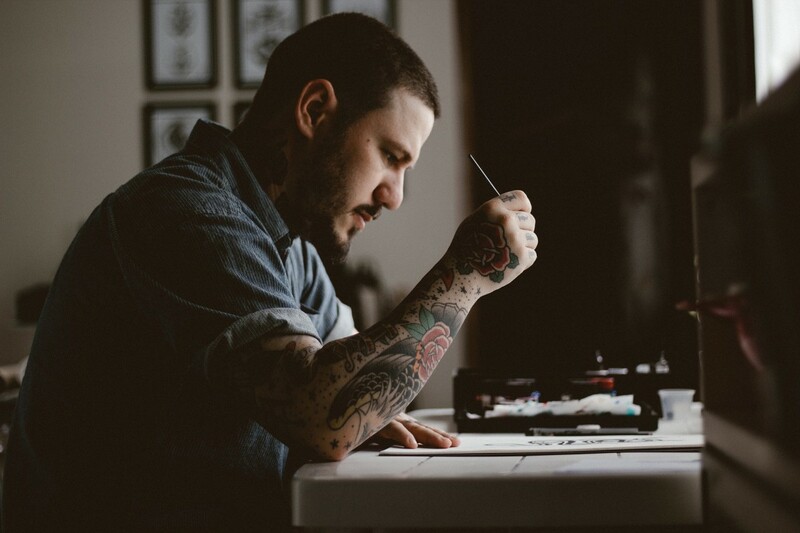 Many tattoo artists try to capture what they think is a "classical" style of tattoo art by dumbing down their designs, or by simplifying the artwork. Simplifying artwork and hoping that it looks "traditional" actually hurts traditional tattoo styling because it gives people a false idea of what the art should look like. Sailor Eddie and his apprentice, Suzie, step outside to enjoy the sunny weather. 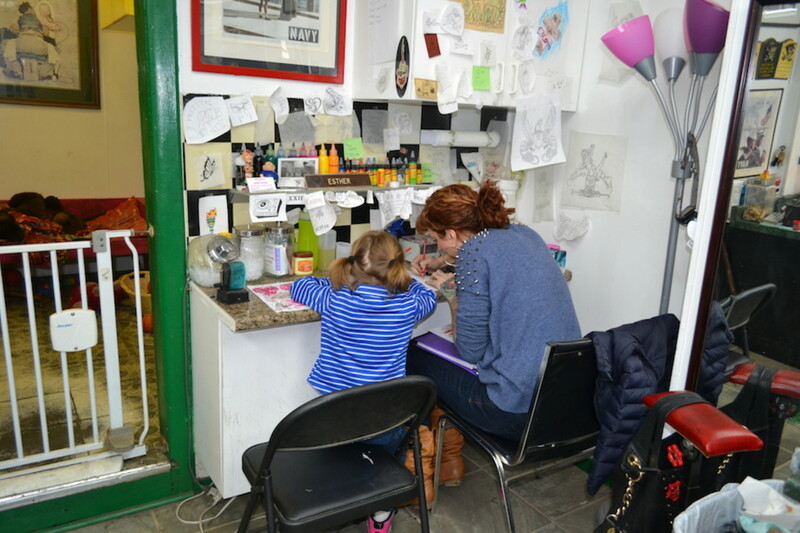 Suzie's daughter spends time at the shop with her and Eddie. They encourage her artistic pursuits. 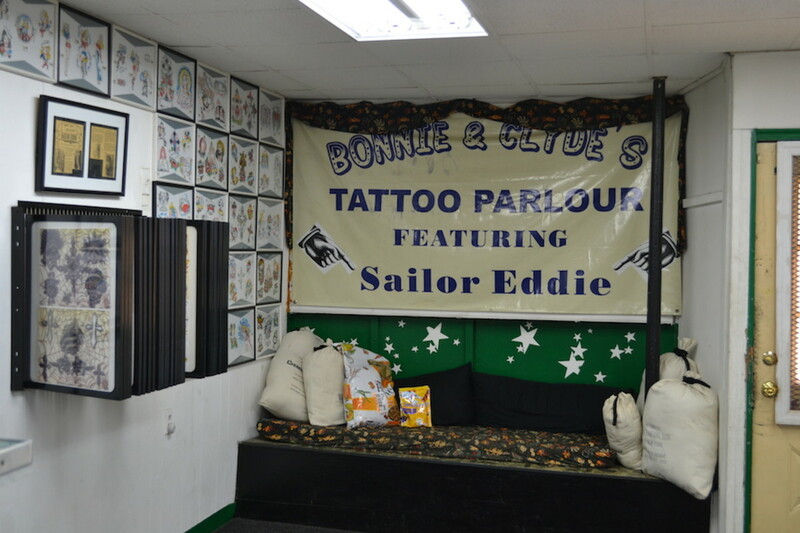 Sailor Eddie began working in his grandparents' tattoo shop when he was five years old. He considers a tattoo shop a great place for a child to grow up. I've been in many shops where children aren't allowed in, even if their parent is a paying customer. I found Sailor Ed's opinion of children in the shop refreshing and enlightening. 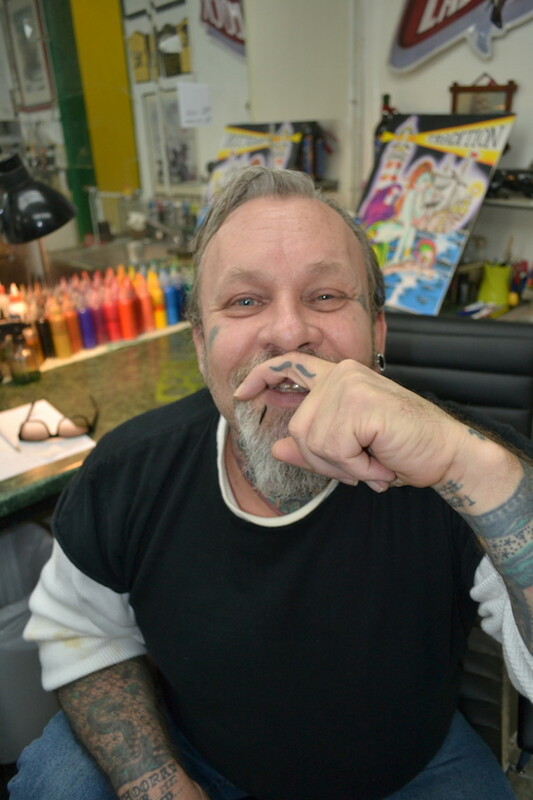 For Eddie, tattooing has always been a family business, and he's keeping it that way. One of Sailor Eddie's signature pieces. This back design is available as a hangable print. A recent back piece sketched by Sailor Eddie. He'll soon send it out as a gift to a friend in the industry. When he isn't tattooing, Sailor Eddie keeps his hands and mind busy designing large back pieces in the traditional style. He draws them in colored pencil rather than with paint. 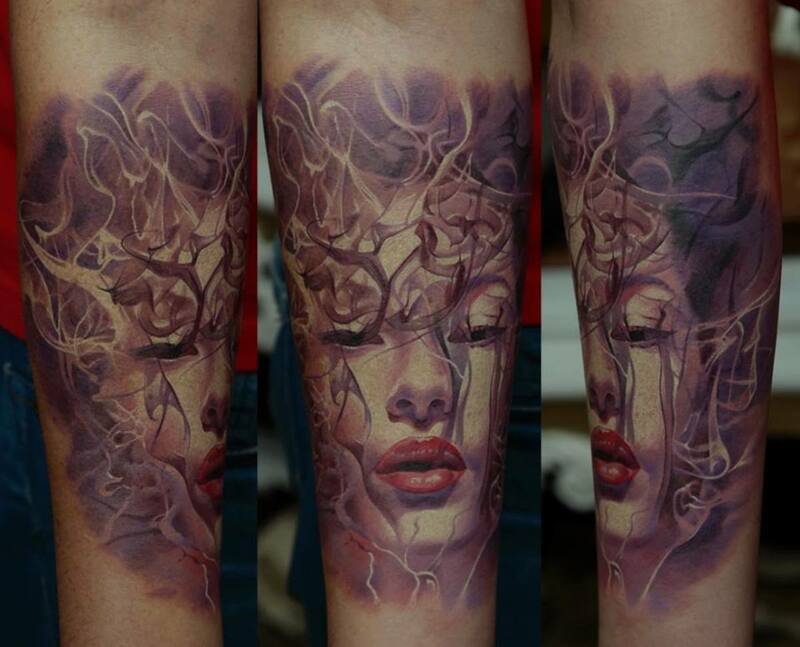 In his opinion, colored pencils "read truer" to what a tattoo really looks like in the skin. 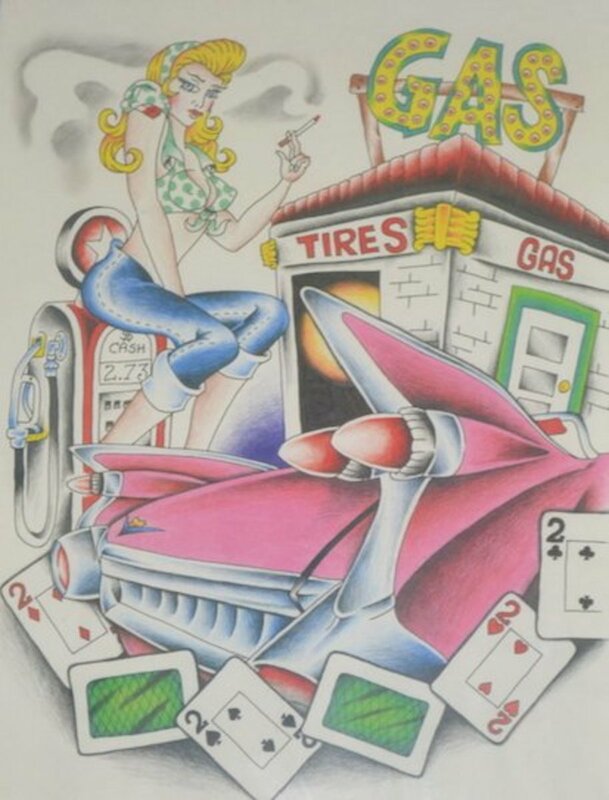 Some of Sailor Ed's back art designs are available as prints that can be purchased at his shop. Most of the back jobs he creates he mails out as gifts to friends and colleagues in the tattoo industry. I feel very fortunate to have made friends with Sailor Eddie. I've been active in the tattoo community for almost 20 years, and Eddie teaches me new things about the art and its history almost every time I talk to him. In addition to the wealth of knowledge he shares, I have prints of some of Eddie's flash art and some of his original work as well. 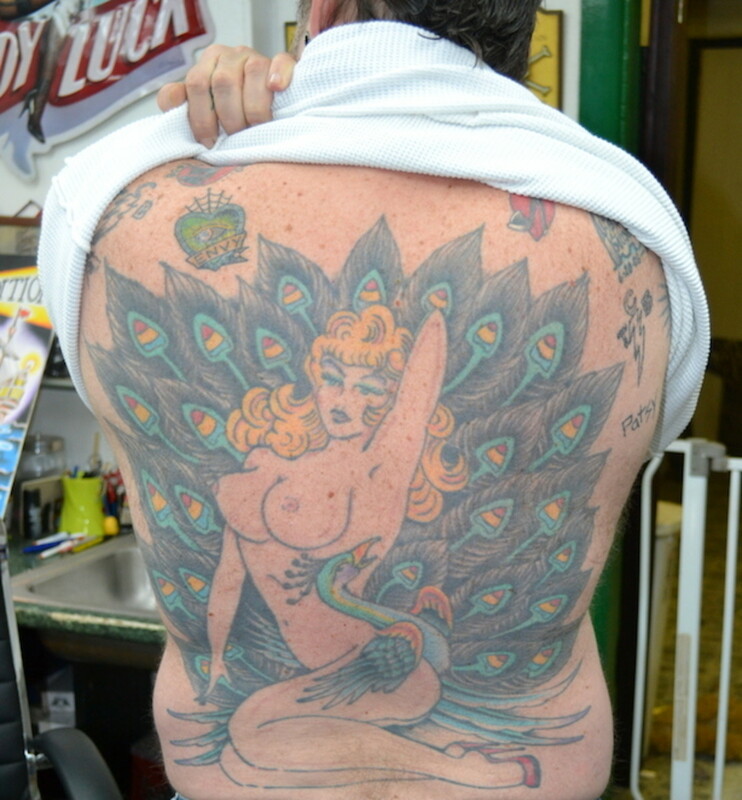 Sailor Eddie's back piece was inked by Dave Gibson at Bill Loika's shop in Deep River, Connecticut, back in the 1980s. After almost 30 years, the tattoo is still clearly visible at a distance. 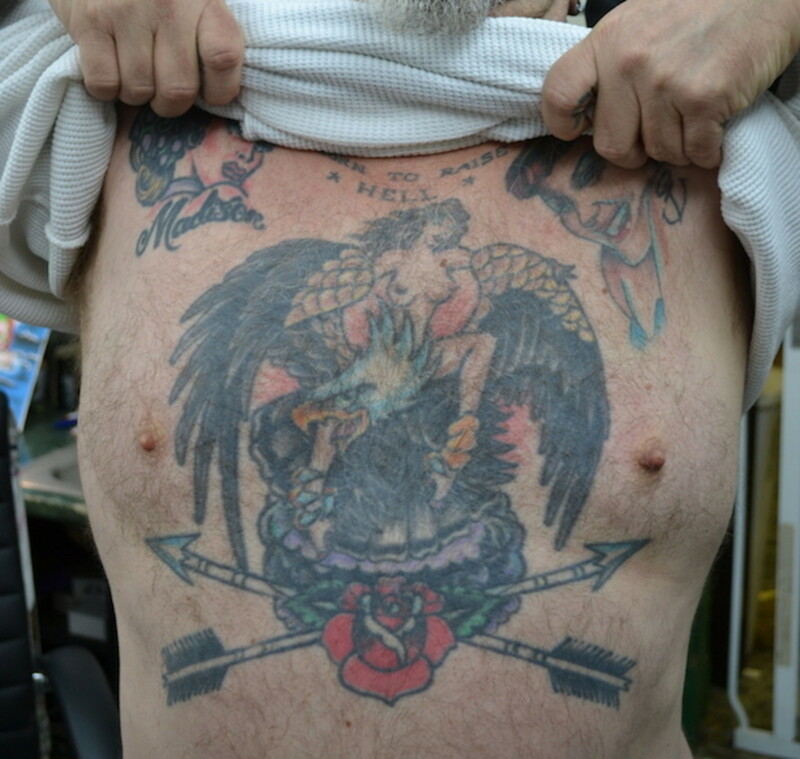 Sailor Eddie's chest art was inked by tattoo artist Mike Wilson during a visit to Ed's shop. Sailor Ed tattooed Wilson's chest piece on the same visit. In addition to his hobby of drawing back piece art, Eddie has a passion for promoting adoption and rescue work for dogs. Sailor Ed's dog, Bonnie, was a rescue. He saw some hooligans trying to force her to dog fight on a street corner. Ed took Bonnie home, and it sparked a passion in him for doing rescue work for dogs. 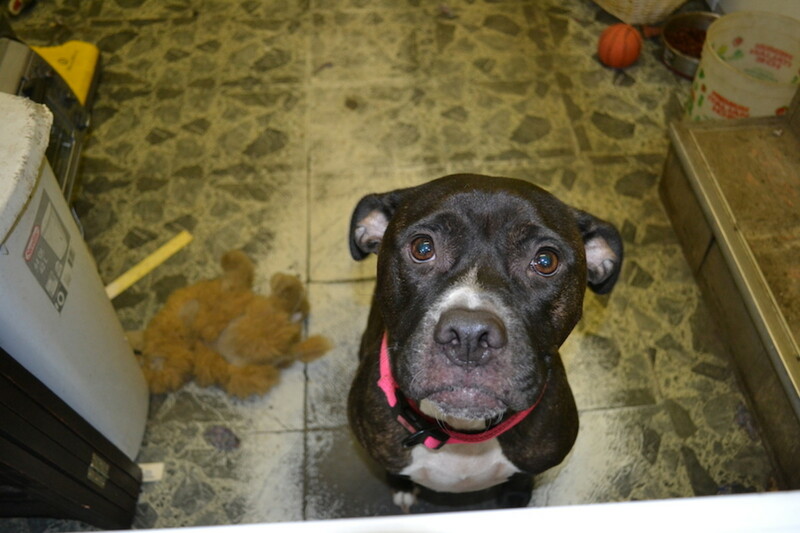 Charity organization "Pinups for Pitbulls" started in Philadelphia. I have noticed that many tattoo artists support dog rescue and adoption, particularly with discriminated breeds. Pinups for Pitbulls uses its magazine and calendar sales to fund various projects that aid animals in need of rescue, and fight breed specific legislation that unfairly targets bulls and other dogs. I asked Ed his thoughts on why it seemed that the tattoo community takes a particular interest in dog rescue. I know many tattoo artists and shops in my home state that support charitable organizations for animals. He says that Pinups for Pitbulls has built an association between hot girls, tattoos, Rockabilly music and culture, and dog rescue. For himself, his dog Bonnie is the reason Ed supports and promotes dog rescue. Bonnie has her own separate room in the back of Eddie's shop. She spends the day well fed, well cared for, and meeting lots of people. Ed offers discounts to customers who bring an eight-pound bag of dog food or other needed items to his shop. On Christmas Eve and other seasonal holidays, Sailor Ed brings all the collected donations of food, toys, and blankets to local shelters and help organizations for dogs. 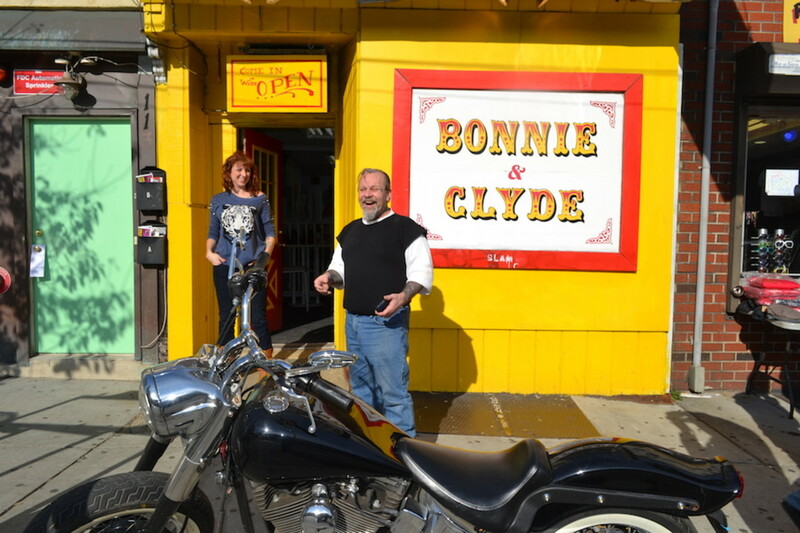 Bonnie & Clyde's Tattoo Parlour is the home of tattoo artist "Sailor Eddie" Ed Denny. Though I haven't known Sailor Eddie long, and most of my interaction with him happens via Facebook, he's a good person to learn things from. Not just about the tattoo industry, but about life and people. On Facebook Ed is gruff, opinionated, bossy, and sometimes even confrontational. Don't let that give you the wrong idea about the man, though. You can learn a great deal from Sailor Eddie about respect. Giving it and getting it. 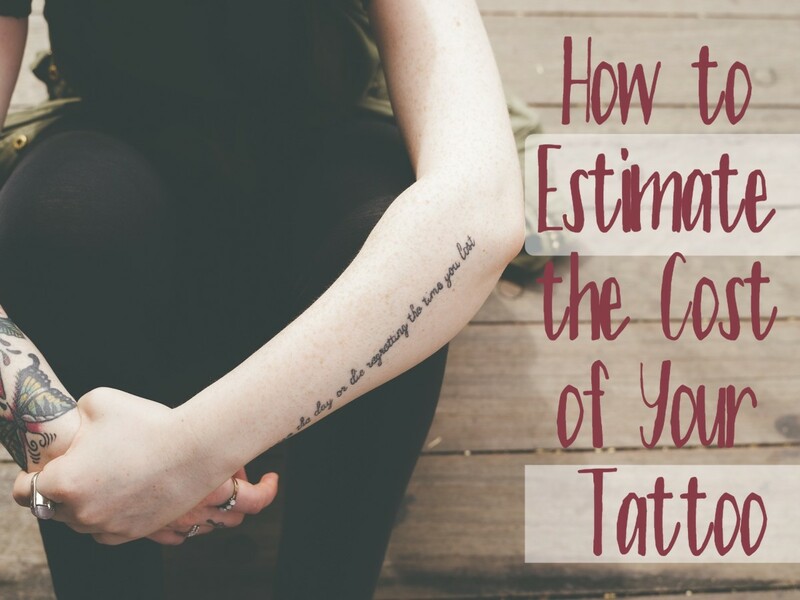 There are lots of jokes and memes about tattoos and tattooed people on the Internet, especially on Facebook. After a while, you become desensitized to it all. I once reposted a tattoo joke and tagged some of my tattoo friends in it. It took Eddie to point out to me that it is pretty crude and offensive for a tattooed person to make fun of another person's tattoos. It is counterproductive to our whole culture. Like all of the truly great men and women I've met in the tattoo industry, Sailor Eddie believes that those that work in tattooing need to conduct themselves always in a professional manner, and that as tattooed people we need to be friendly and represent our culture respectfully. If you're in the Philadelphia area, you can get a beautiful piece of art from Sailor Eddie. He wants tattooed people to wear their ink with pride, and it shows in his work.